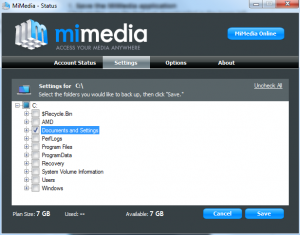 7GB of free space which is more than most providers. 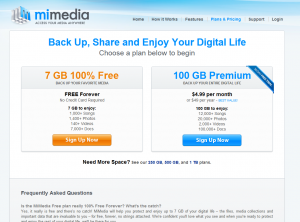 Their prices are good per GB, you can get 100GB for $4.99 per month. Their software does not have all the features a power user could want. You can sign up now. Founded in 2012, MiMedia is an angel investment funded online backup service. They seem to have a lot of experienced business people running the company, so I hope that means they pay a lot of attention to the customer! They do have quite a few decent blog posts, so they are definitely paying attention to the business. Their prices are good, about average, however you can get 7GB for free which is a good amount, and more than almost anyone else offers! 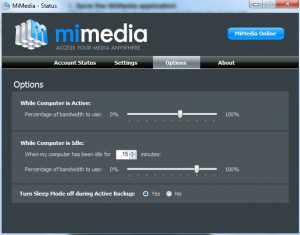 Their software is only 3MB, which I was really impressed with as most software is 20-30MB. 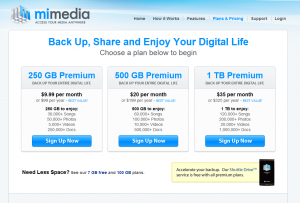 We can say that these prices are average, you can get unlimited space now for $7 per month, but 250GB for $10 is about average. 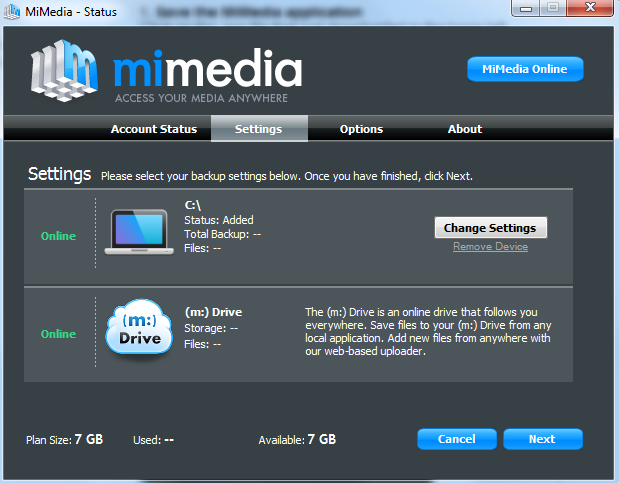 Shuttle drive service, where they post a hard disk to you, you add the files you want and post it back! I couldn’t find too much information on the website about security, what they mention is that they have a secure Tier 1 data center with redundancy (meaning if one hard disk fails another also stores your data as a secondary backup). They do claim to have some sort of unique system for delivering your files quickly. They have the standard help pages which explain how to use the system, although a bit lacking in screenshots it is sufficient. Their customer service reps replied to a query within 24 hours, which is an acceptable time frame. 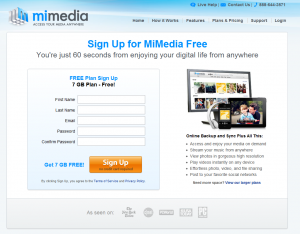 I like their website design, it is easy to find everything and definitely looks like it is from the Web 2.0 generation. I also like how you can find out their pricing structure within 2-3 clicks of the homepage, a lot of companies hide their pricing from the front page. There is a small signup form to fill out, pretty simple. Once that is filled out, the download of the software starts straight away, which is only 3MB, I’m amazed by how small their software is. Unfortunately once downloaded you need to login again. Despite their website being nicely designed, I’ve seen better designed software before, I didn’t think MiMedia software was that nice to look at. 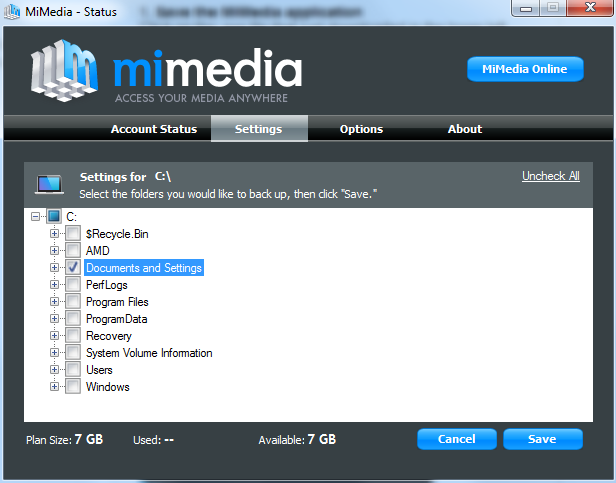 Once signed in you go through the setup process, first of all selecting what folders you want to back up. 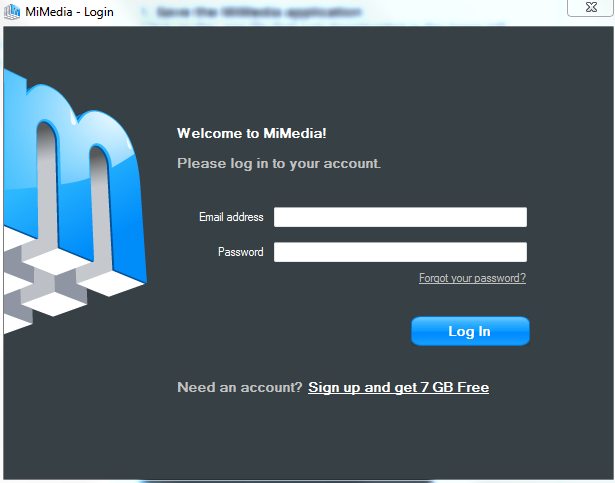 Their software actually creates a virtual folder called m: which is where everything is backed up. 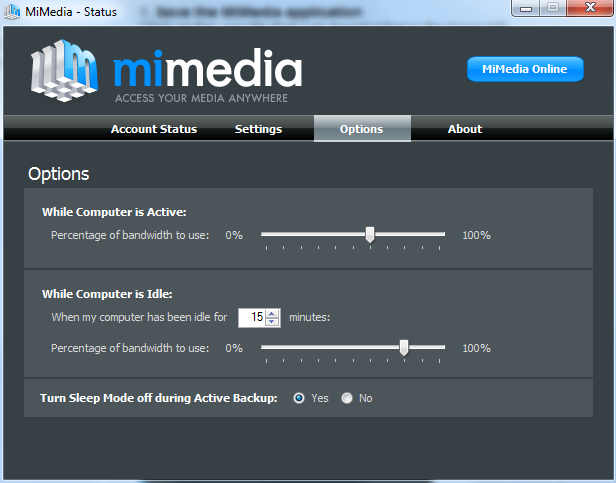 Their options menu is fairly limited, all you can change is the bandwidth usage. 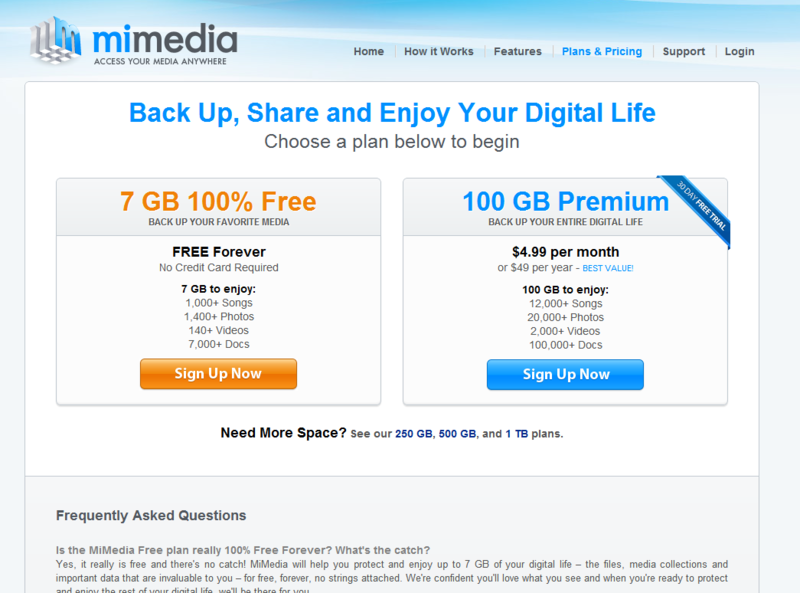 Free space is great at 7GB, and for paid services their prices are average. The website is very nice, but the software isn’t that great, and doesn’t have a lot of advanced features that people might want to use. 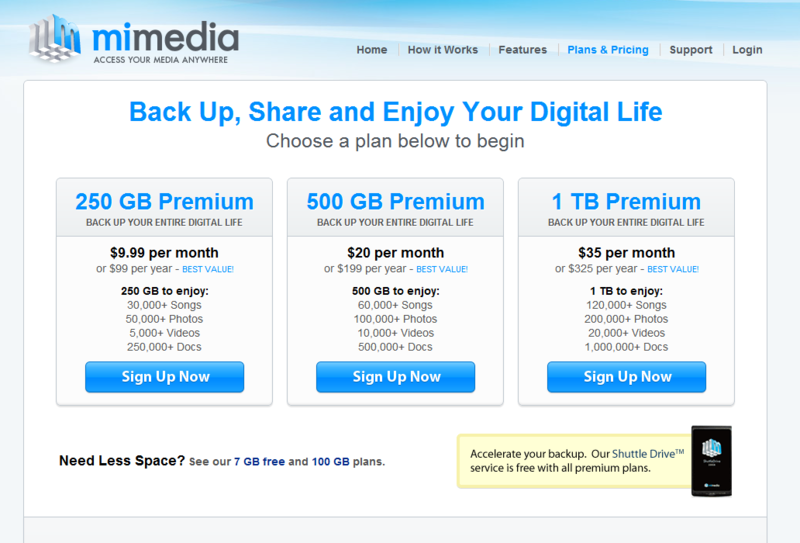 The shuttle drive is a great concept though, I really like the idea of backup-via-postage to save bandwidth if you need it.